The SpineAssist robot attaches directly to the spine during operations. It has Food and Drug Administration approval to assist surgeons in the precise placement of tools and implants. The robot, which is about the size of a soda can, was developed by Mazor Surgical Techniques; two systems have been installed in the United States. It can shorten surgery time, increase accuracy and minimize postoperative complications. Nerve damage can occur in 2 to 3 percent of spinal surgical procedures. SF fans are familiar with robots that either assist physicians, or, in the case of the crechepod, take over for doctors and nurses entirely. 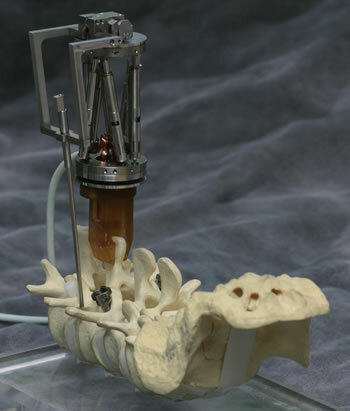 See FDA approval for miniature robot for spinal procedures and Mazor Surgical Technologies for more information.